NM23-H1 (also known as NME1) was the first identified metastasis suppressor, which displays a nucleoside diphosphate kinase (NDPK) and histidine protein kinase activity. NDPKs are linked to many processes, such as cell migration, proliferation, differentiation, but the exact mechanism whereby NM23-H1 inhibits the metastatic potential of cancer cells remains elusive. However, some recent data suggest that NM23-H1 may exert its anti-metastatic effect by blocking Ras/ERK signaling. In mammalian cell lines NDPK-mediated attenuation of Ras/ERK signaling occurs through phosphorylation (thus inactivation) of KSR (kinase suppressor of Ras) scaffolds. In this review I summarize our knowledge about KSR’s function and its regulation in mammals and in C. elegans. Genetic studies in the nematode contributed substantially to our understanding of the function and regulation of the Ras pathway (i.e. KSR’s discovery is also linked to the nematode). Components of the RTK/Ras/ERK pathway seem to be highly conserved between mammals and worms. NDK-1, the worm homolog of NM23-H1 affects Ras/MAPK signaling at the level of KSRs, and a functional interaction between NDK-1/NDPK and KSRs was first demonstrated in the worm in vivo. However, NDK-1 is a factor, which is necessary for proper MAPK activation, thus it activates rather than suppresses Ras/ MAPK signaling in the worm. The contradiction between results in mammalian cell lines and in the worm regarding NDPKs’ effect exerted on the outcome of Ras signaling might be resolved, if we better understand the function, structure and regulation of KSR scaffolds. nm23-H1, also known as nme1, was the first identified metastasis suppressor gene . The reverse correlation between NM23 expression and metastatic potential had been reported many times using cell lines and xenograft models (reviewed in ). The metastasis inhibitor effect was also demonstrated using mouse models: double transgenic mice derived from a cross of nm23-M1 knockout mice with a mouse strain prone to hepatocellular carcinoma show a higher incidence of lung metastases . Members of the nme gene family encode nucleoside diphosphate kinases (NDPK) . In recent years NDPKs have been ascribed numerous roles in development that are inconsistent with a simple housekeeping role of balancing pools of nucleoside diphosphates and triphosphates. Recent data suggest that members of the nm23 family display multiple functions in diverse biological processes such as signal transduction, growth control, differentiation, cell migration, cancer promotion [5 - 7]. Although the exact molecular process by which NM23 inhibits the metastatic potential of cancer cells is unknown, some molecular mechanisms have been proposed to explain its anti-metastatic activity. NM23 silencing in hepatoma and colon carcinoma cell lines resulted in upregulation of the membrane associated matrix metalloproteinase (MT1-MMP), increased Rac1 signaling and activation of several pro-invasive signaling pathways such as MAPK (mitogen activated protein kinase)/SAPK (stress-activated protein kinases), Akt . Elevated Rac1 level upon NM23 knockdown suggests that NM23 inhibits Rac1 activation. Although the exact mechanism is unknown, NM23-H1 was shown to interact with factors involved in Rac1 activation, such as the small GTPase Arf6 or the nucleotide exchange factor Tiam1 [9,10]. ARF6 by recruiting NM23-H1 was reported to facilitate dynamin-mediated endocytosis during adherens junctions disassembly and NM23-H1 was suggested to provide a source of GTP for ARF6 . The highly specific functional relationship between dynamin and the NM23 homolog AWD in endocytosis was demonstrated by genetic studies in Drosophila. AWD functions as a negative regulator of cell migration in tracheal and border cells by downregulating receptor levels on the cell surface through dynamin-mediated endocytosis [12,13], thus it suppresses cell motility through receptor internalization. Some studies suggest that NM23-H1/H2 may exert its anti-metastatic effect by blocking Ras/ERK (extracellular signal-regulated kinase) signaling [14 - 17]. In this review I summarize how NM23-H1 inhibits the Ras/ERK cascade in human cell lines, and examine how the NM23 homolog NDK-1 modifies the outcome of Ras signaling in the model organism Caenorhabditis elegans. ksr (kinase suppressor of Ras) genes were initially identified in C. elegans and Drosophila melanogaster as positive regulators of Ras/MAPK signaling [26 - 28]. The Drosophila genome encodes only a single ksr gene which is essential for viability in the fly . In the worm, mutations in ksr-1 were isolated in genetic screens searching for suppressors of the Muv (multivulva) phenotype caused by a gain-of-function allele of let-60/Ras[26,27]. In contrast to its fly counterpart, ksr-1 is not an essential gene as ksr-1 null mutants are viable and do not show severe defects in development. However, subsequently a second ksr ortholog was identified in the nematode genome, ksr-2. In the germline Ras/MAPK signaling driven by an unknown ligand mediates progression of germ cells through the meiotic pachytene stage . ksr-2 loss-of-function mutants display a sterile gonad with germ cells arrested at pachytene, similar to null mutants of other MAPK cascade genes [29,31]. The mouse genome contains two KSR paralogs, KSR1 and KSR2. KSR1 knockout mice are viable and do not display major developmental defects [32,33], suggesting large degree of functional redundancy between the different isoforms in this organism as well. However in KSR1−/− mice, as a consequence of decreased MAPK signaling T-cell activation is impaired , these animals have enlarged adipocytes  and are slightly glucose intolerant . Glucose homeostasis is regulated by the MARK2 kinase, which phosphorylates and inactivates KSR1, thus leading to dampened ERK signaling . KSR2−/− mice were found obese and also glucose intolerant . Obesity in KSR2−/− mice is linked to AMPK dependent glucose uptake and fatty acid oxidation, as KSR2 interacts with AMPK and modulates its activity . Mutations in KSR-2 were recently described to be associated with obesity and insulin resistance in human . It is important to note that mouse KSR1−/−; KSR2−/− double mutants have not yet been described. KSRs are known as scaffold proteins which coordinate the assembly of membrane-localized Raf/MEK/ERK complexes [39 - 41]. KSR1 is able to bind all three kinases of the MAPK pathway: it associates constitutively with MEK, but interaction with C-Raf and ERK1/2 occurs only upon growth factor stimulation [39,42]. Thus, upon Ras activation KSR brings MEK to the plasma membrane in close proximity to the Raf kinase. In principle, KSR provides a scaffold, which facilitates the phosphorylation steps in the MAPK cascade in order to execute signal transduction downstream of Ras. The domain structure of KSR proteins is similar to that of Raf family members indicating their possible common origin (reviewed in ). KSR proteins consist of five conserved regions, termed CA1–CA5 (summarized in Figure 1). The N-terminal CA1 domain is unique for KSRs, this domain was shown to bind Raf in the Drosophila KSR homolog (reviewed in ). The CA2 domain contains a proline-rich region, whereas the CA3 domain possess a cysteine-rich region. The CA3 domain is able to bind lipids, it ensures membrane anchorage of KSR upon Ras activation, thus this domain regulates the cellular localization of KSR . The CA4 domain contains a serine/threonine-rich sequence and conserved sites (FXFP, Figure 1) for ERK docking [41,45]. Finally, the CA5 domain is a C-terminal kinase-like domain, which is similar to the kinase domain of Raf proteins and seems to be important for MEK binding . KSR1 is considered to be a pseudokinase that lacks catalytic activity because of the absence of an invariant Lys residue in subdomain I, which is important for orienting ATP in Raf. This critical Lys is exchanged for Arg in human KSR1, but we note that Drosophila KSR and C. elegans KSR-1 (but not KSR-2) contain Lys in the conserved position. Together, to date still debates exist about KSR’s catalytic activity. Sequence comparison of the worm KSR proteins reveals that C. elegans KSR-1 and KSR-2 share 26% and 31% overall sequence identity with murine KSR1 [18,29]. Genetic analyses show evidences that worm KSR-1 and KSR-2 are both functional KSR family members [26,27,29], however differences can be seen in their domain structure compared with murine KSR1, the best characterized mammalian KSR (Figure 1). The CA1 domain is missing in both C. elegans KSR homologs, in addition, worm KSR-1 lacks the CA2 domain, whereas in KSR-2 the CA4 domain with the ERK docking site is absent (Figure 1). 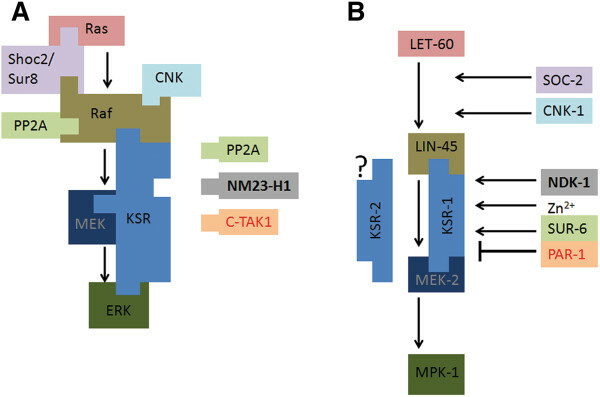 Scaffolds of the Raf/MEK/ERK cascade and regulation of KSR in mammals and in the nematode. SOC-2/SUR-8, CNK/CNK-1 and KSR are scaffolds of the Raf/MEK/ERK cascade. SOC-2/SUR-8 and CNK/CNK-1 are thought to facilitate Raf activation [52,53]. KSR assembles Raf/MEK/ERK complexes and functions downstream of Raf. A) Protein interactions in mammals . C-TAK1 and Nm23-H1 phosphorylate Ser392 of mammalian KSR, while PP2A is able to dephosphorylate the same residue. 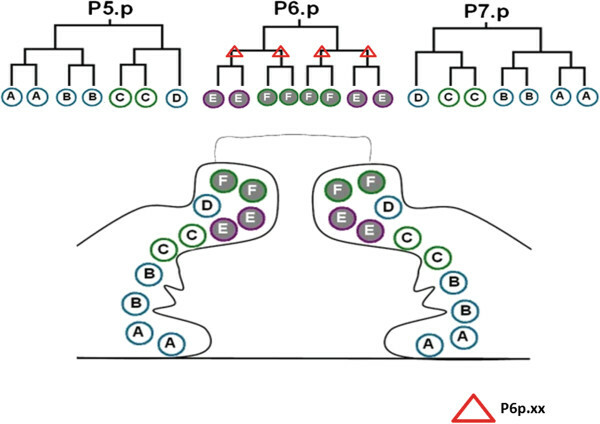 B) Genetic interactions in C. elegans. PAR-1 inhibits, while SUR-6/PP2A activates KSR-1. NDK-1 activates Ras signaling at the level of KSRs. The molecular mechanisms are not known. The regulation of KSR-2 remains to be determined. The mammalian proteins and their nematode homologs are labeled by the same color. Modulators of KSR activity were also identified in C. elegans. As EGFR/Ras/ERK activity is indispensable for vulval induction, differences in the level of MAPK signaling can be measured by scoring the formation of a reduced or enhanced number of vulval structures. Thus, the vulval induction system provides a unique opportunity to identify regulators of the Ras/ERK cascade. Genetic epistasis analyses demonstrated that the C-TAK1 homolog PAR-1 kinase and the worm counterpart of PP2A phosphatase, SUR-6/PP2A act downstream of LIN-45/Raf, at the level of KSR-1 [52,55]. PAR-1 regulated KSR-1 activity negatively, whereas SUR-6/PP2A modified the effect of KSR-1 positively, similar to data derived from human cell lines [52,55] (Figure 2B). However, as 14-3-3 binding sites Ser297 and Ser392 are not present in the worm KSR-1 protein (Figure 1), the exact mechanism of action whereby PAR-1 and SUR-6/PP2A modify KSR activity remains elusive. In the human breast carcinoma cell line MDA-MB435 and in HEK293 cells NM23-H1 has been shown to phosphorylate KSR1 on Ser392 [14,15,17], and NM23-H1 overexpression in those cells resulted in reduced levels of MAPK signaling. Conversely, silencing of NM23-H1 in HepG2 hepatocellular carcinoma cells induced elevated phospho-ERK levels . It was also suggested that increased levels of NM23-H2 block the ERK pathway . Thus, NDPKs might attenuate Ras/ERK signaling through phosphorylation (thus inactivation) of KSR scaffolds. Contradictions between mammalian and C. elegans data regarding the effect of NDPKs on the outcome of Ras/ERK signaling could be resolved if we better understand the function and regulation of KSR scaffolds. Mouse KSR1 harbors 14-3-3 binding sites Ser297 and Ser392 that are involved in KSR scaffold regulation in mammals . The implicated residues, however, are evolutionary not conserved in C. elegans KSR proteins (Figure 1) , suggesting that a 14-3-3 domain binding triggered attenuation may not be operating in the worm. Genetic data demonstrate that the C-TAK1 homolog PAR-1 kinase and SUR-6/PP2A phosphatase are involved in the regulation of worm KSR-1 similar to their human counterparts, but the exact KSR-1 residues where PAR-1 and SUR-6/PP2A act, are not known (Figure 2) [52,55]. Worm KSR-2 seems to be the most divergent member of the KSR family, as it lacks the CA1 region and the CA4 domain, which contains the ERK docking site (Figure 1) . Therefore, it is possible that KSR-2 might function differently from other KSR proteins, and its regulation might involve other mechanisms. It is also important to consider that Raf activation might occur differently in the worm compared to mammals, as in C. elegans only B-Raf (LIN-45) is present but not C-Raf . Novel studies suggest that dimerization involving KSR is crucial for Raf activation, in addition unphosphorylated KSR might exert an inhibitory effect on Raf activation [47 - 49]. Not only the phosphorylation status of KSR, but also its expression level might be important regarding the outcome of MAPK signaling, as early studies on overexpression of mammalian KSR pointed to a negative role for KSR in signaling, while later loss-of-function studies suggested a positive role (reviewed in ). Recently pioneering work has shown that in HEK293 cells RGS19 (regulator of G protein signaling 19) is able to suppress Ras signaling through upregulation of Nm23 expression and NM23-mediated phosphorylation of KSR . KSR and Nm23 were also linked to G protein signaling [59,60]. RGS19 is classified as a member of the RZ/A subfamily of RGS proteins . This subfamily is also represented in the worm by RGS-1 and RGS-2 although they lack an N-terminal cysteine string, which is present in human family members [62,63]. Further investigations are necessary to explore, whether the function of C. elegans RGS-1 and RGS-2 is related to the NDK-1/KSR interaction, and to see how transcriptional activation of ndk-1/nm23 is regulated. Nevertheless, mutagenesis screens could be performed in C. elegans in order to identify upstream regulators of ndk-1/nm23. Sundaram, MV Canonical RTK-Ras-ERK signaling and related alternative pathways. WormBook, The Online Review of C. elegans Biology (ed. The C. elegans Research Community), doi/10.1895/wormbook.1.80.2, http://www.wormbook.org. Sternberg, PW Vulval development. WormBook, The Online Review of C. elegans Biology (ed. The C. elegans Research Community), doi:10.1895/wormbook.1.6.1, http://www.wormbook.org..